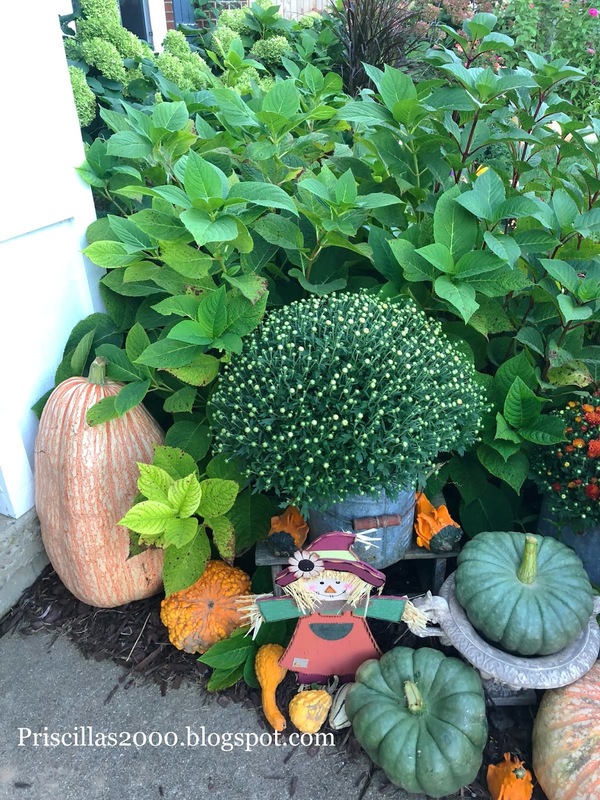 I mounted it on the same galvanized pedestal frame that Basketfull of summer and Basketful of Spring were on .. 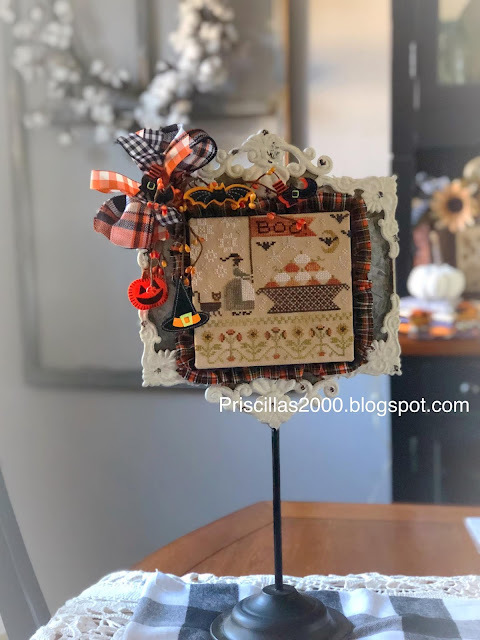 I added licorice Lady Dot Creates Ric Rac .. and then a torn ruffled strip of Halloween homespun .. made a bow from Halloween plaid ribbon ..black gingham ..and orange gingham . 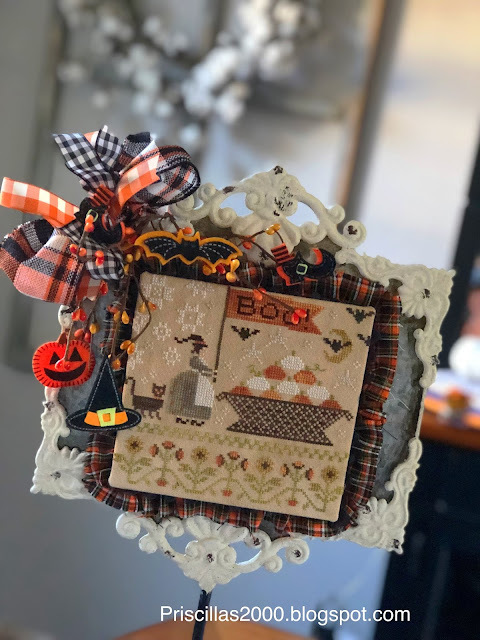 I added Halloween colored berry pick and little felt Halloween cuties that came from Dollar Tree..
Love it and am so happy to add it to my Halloween decorations! 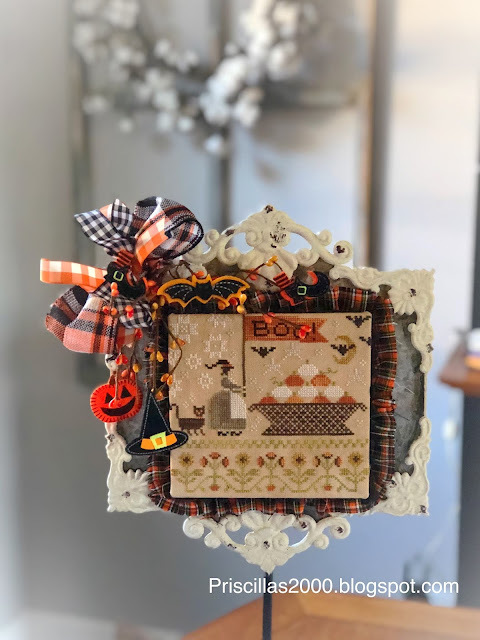 Second finish is this cuteness from Heart In Hand ..Hocus Pocus I mounted it on sticky board and added Lady Dot creates mini pompoms in the color Jack.. A torn homespun ruffle ..an orange gingham bow and a covered button in black homespun finish it off .. it is Cute and only took 2 nights of stitching! 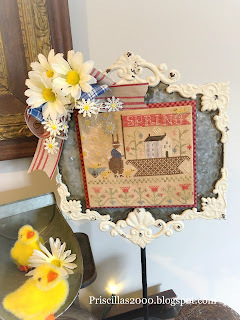 The Classic Colorworks floss I used are above.. 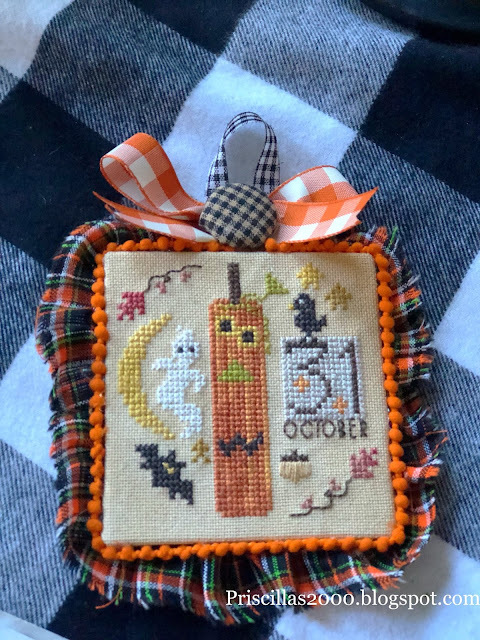 This will be an ornament for my Halloween tree ..that hopefully will be put up this weekend ..
Chelsea stitched Lizzie Kate's Halloween Rules last year and we finally finished it up! 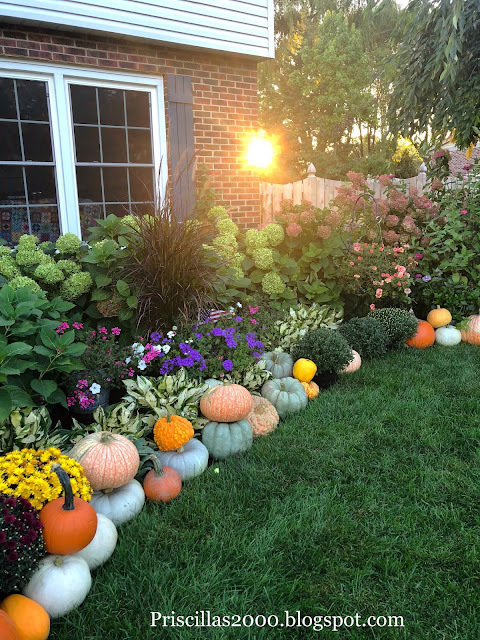 Then came the fun part. 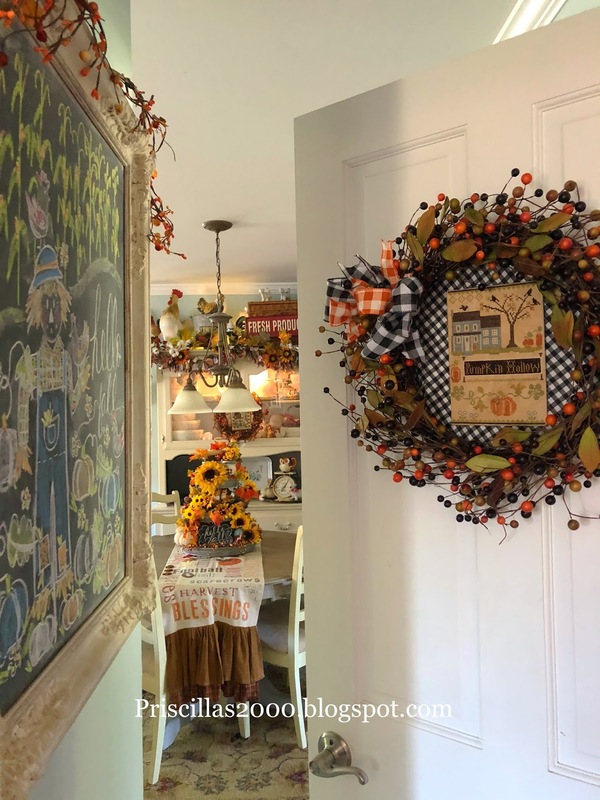 We constructed a garland of black pom poms made from yarn, ripped fabric strips, handmade felt candy corn, and Halloween felt stickers from the Dollar Tree. 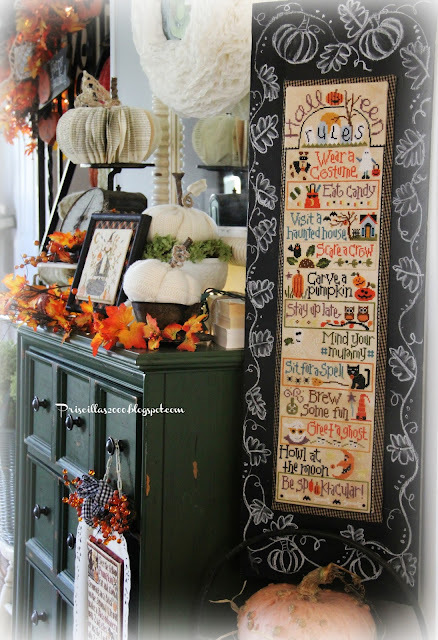 This is my 2nd finish of Halloween Rules.. below is mine ..
Good morning friends! 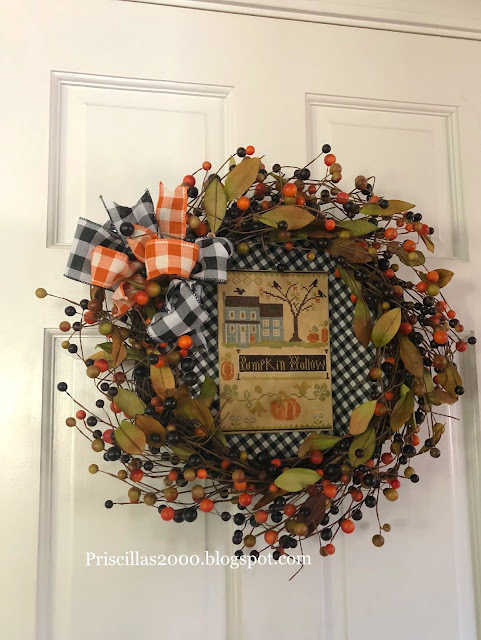 Is this just not the prettiest wreath ever ?!? 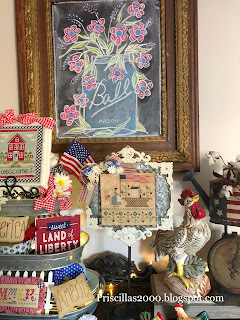 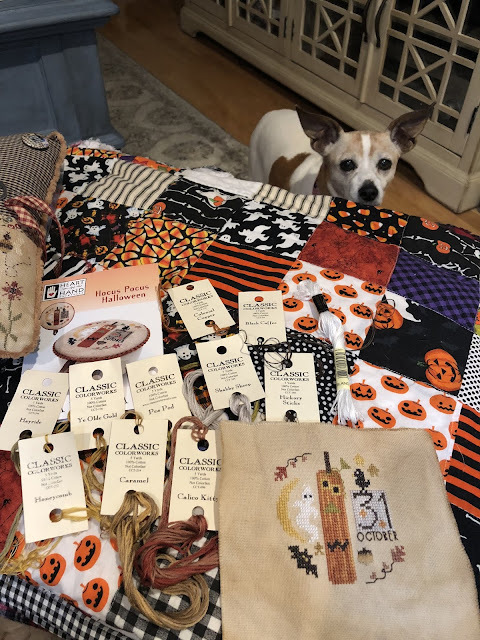 This is a stitch along on our You Tube channel #pcpumpkinhollowfarm ..Below are all of our stitchalongs and the days of the week that we stitch different themes .. thanks for joining us! Come join us in our stitch alongs! 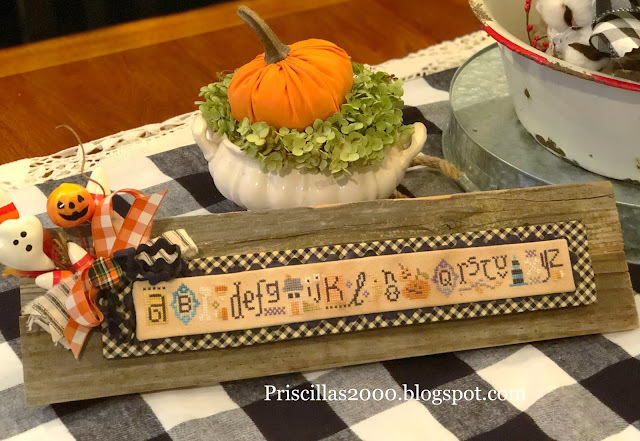 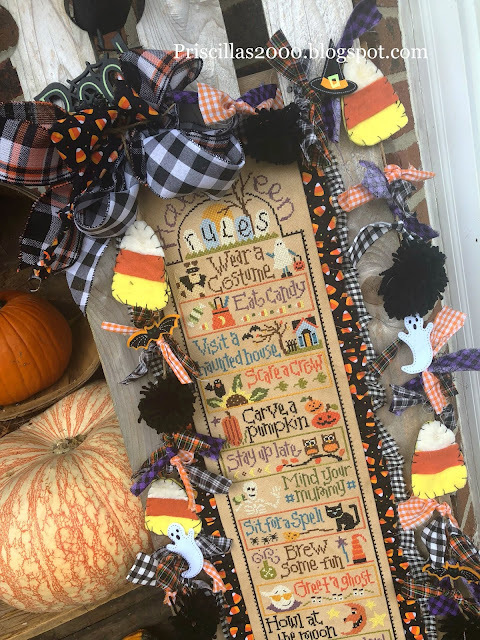 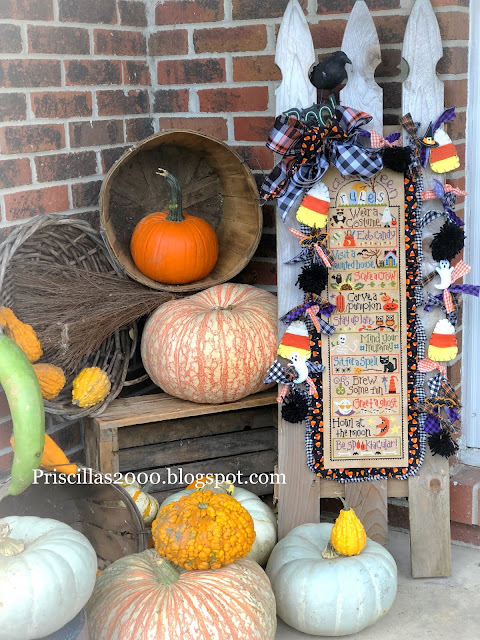 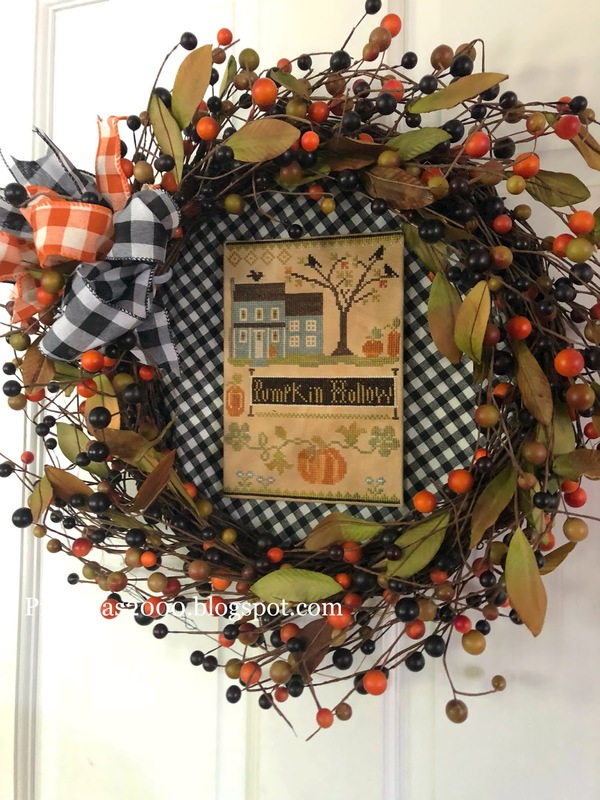 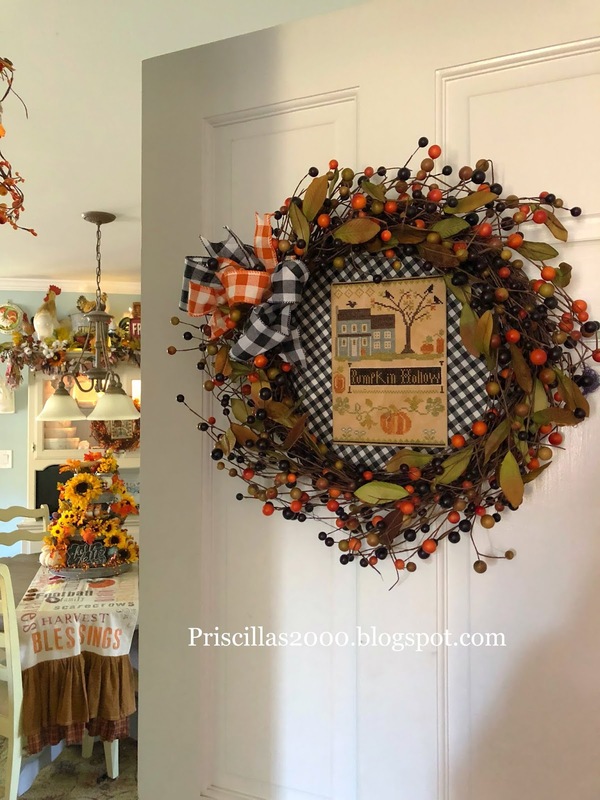 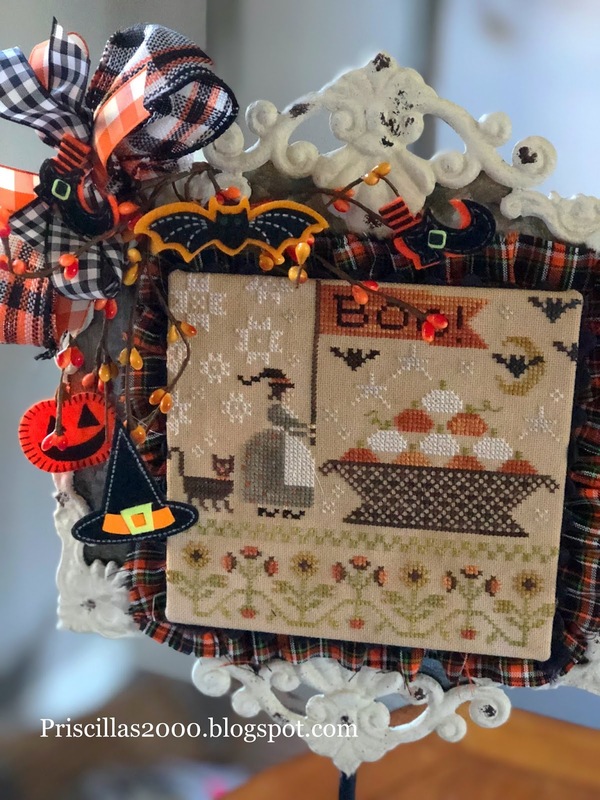 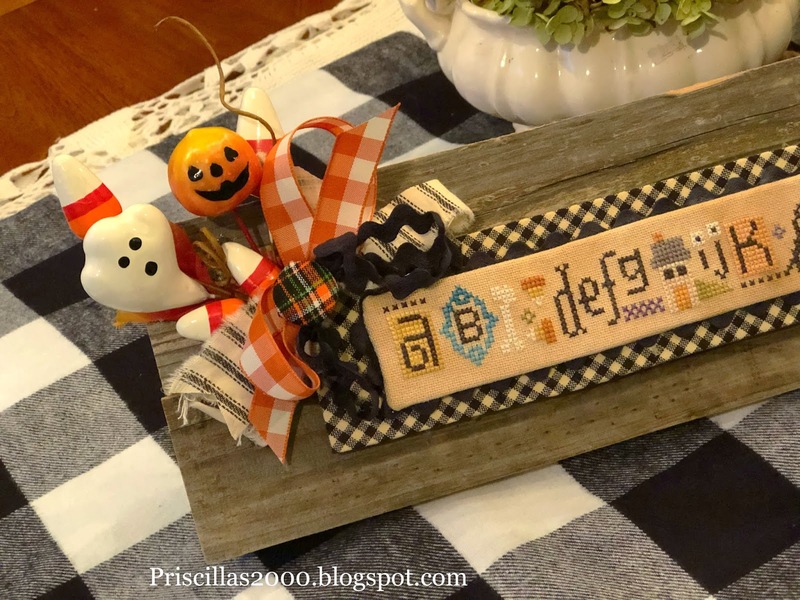 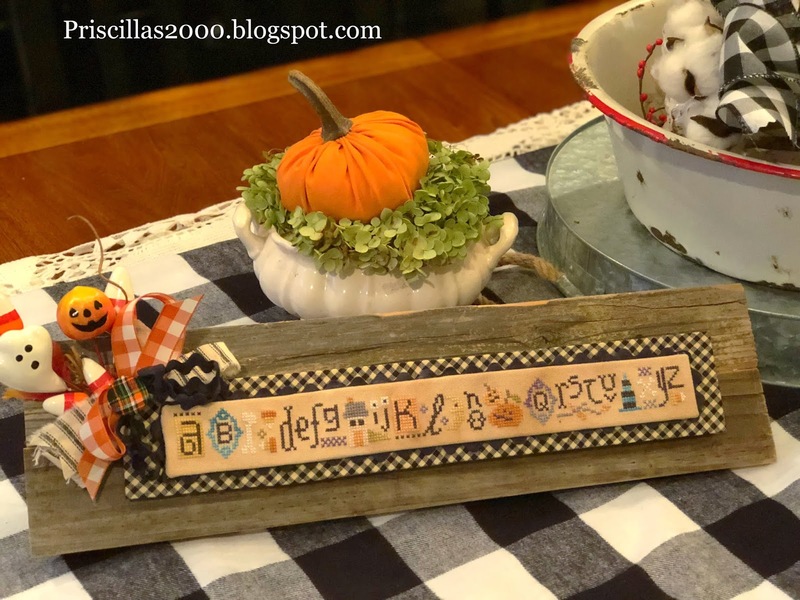 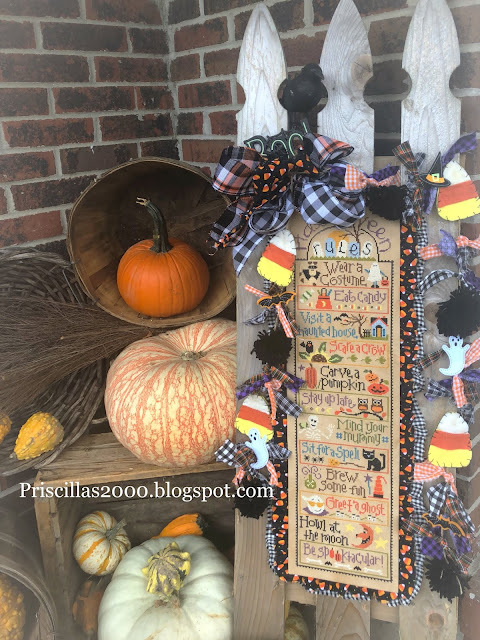 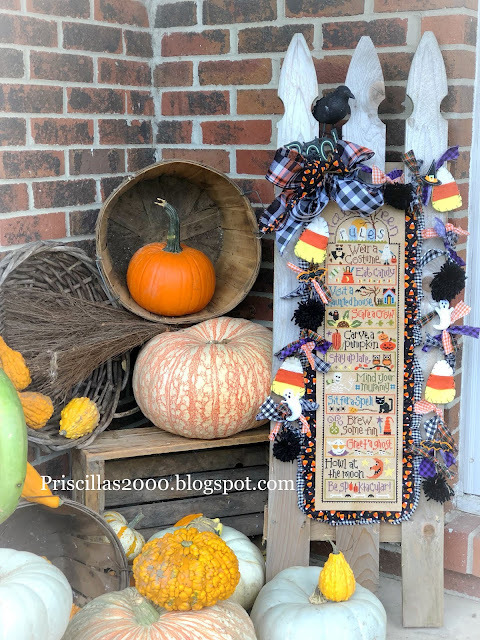 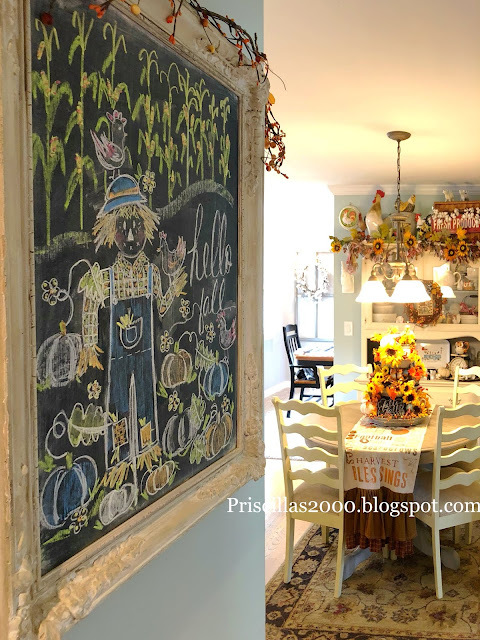 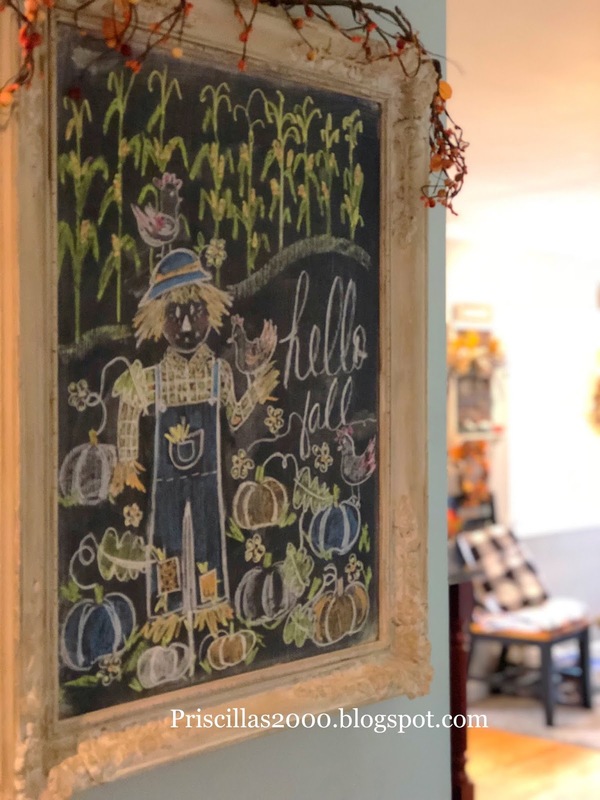 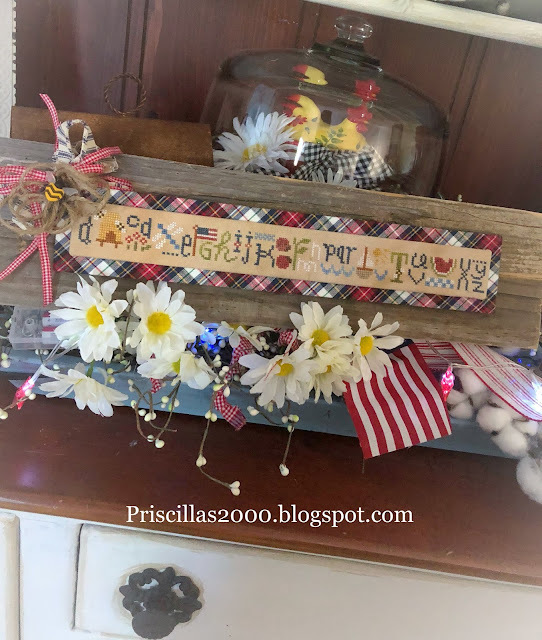 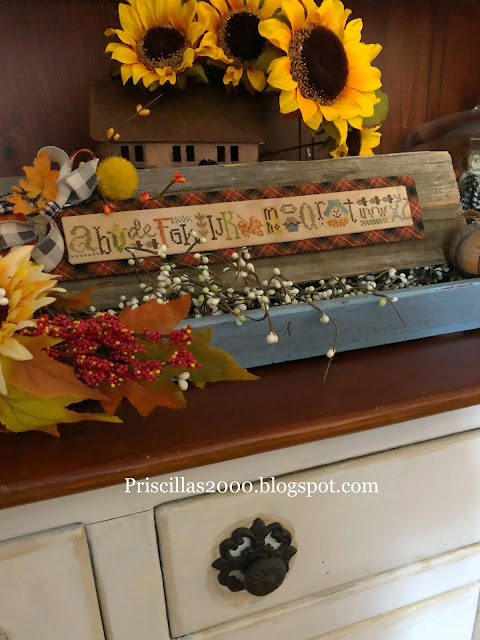 It is hanging on the basement door in the kitchen and it looks so pretty with all the other Fall decor ..Thanks so much for stopping by! 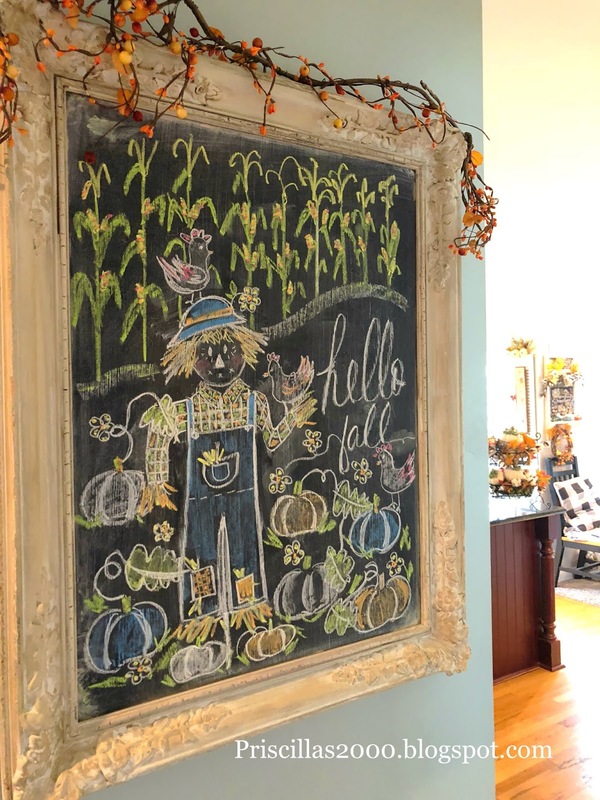 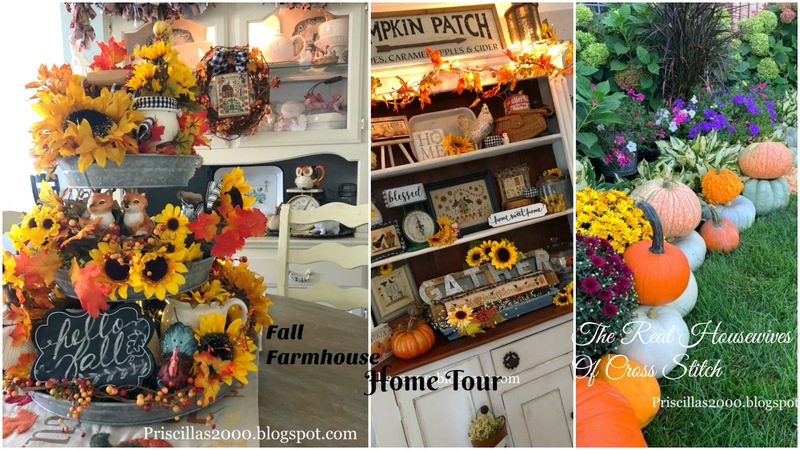 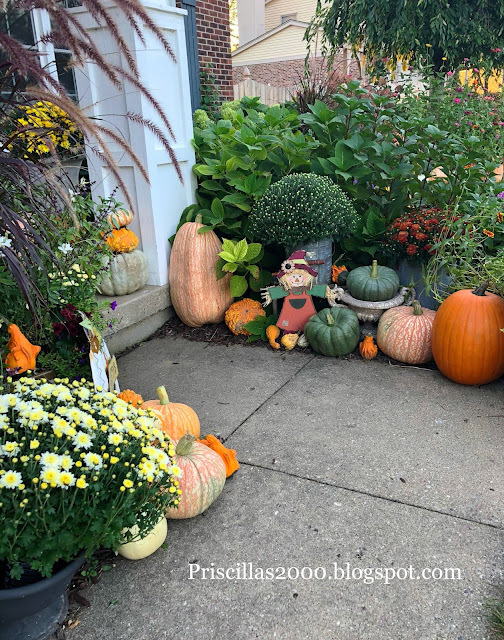 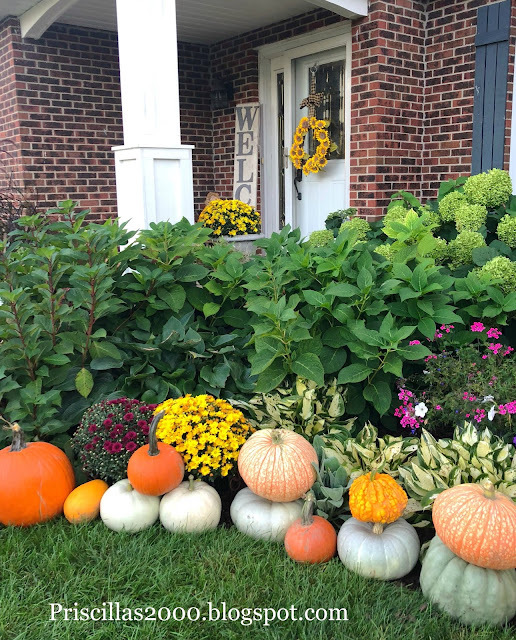 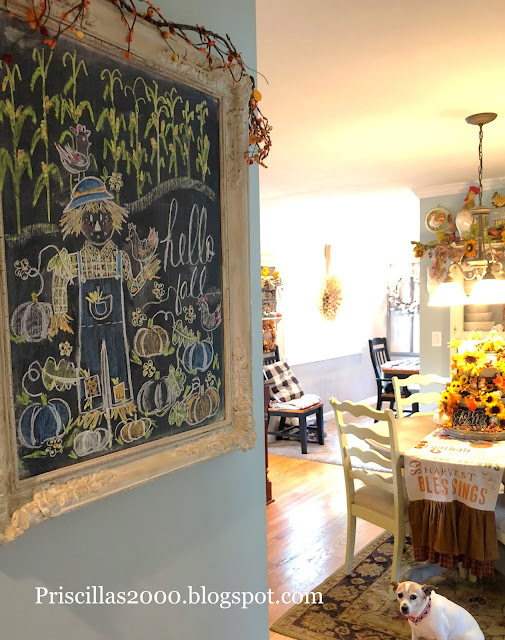 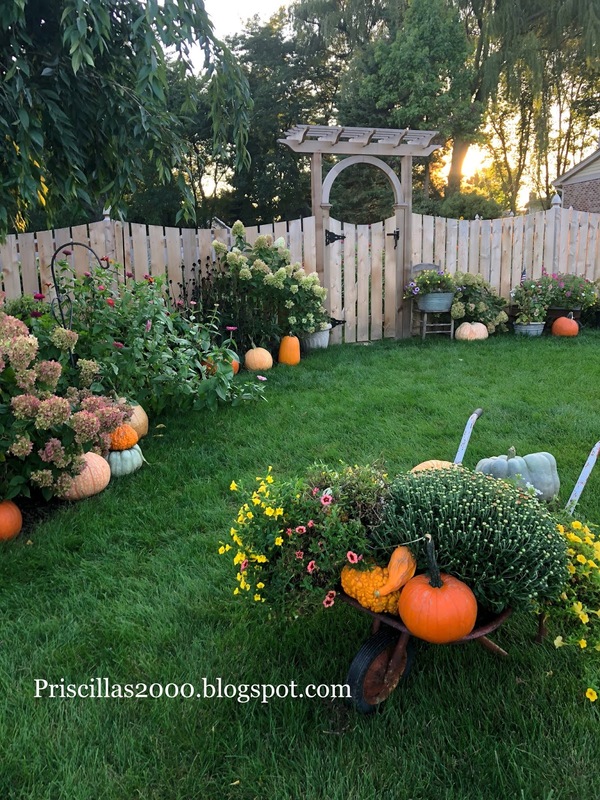 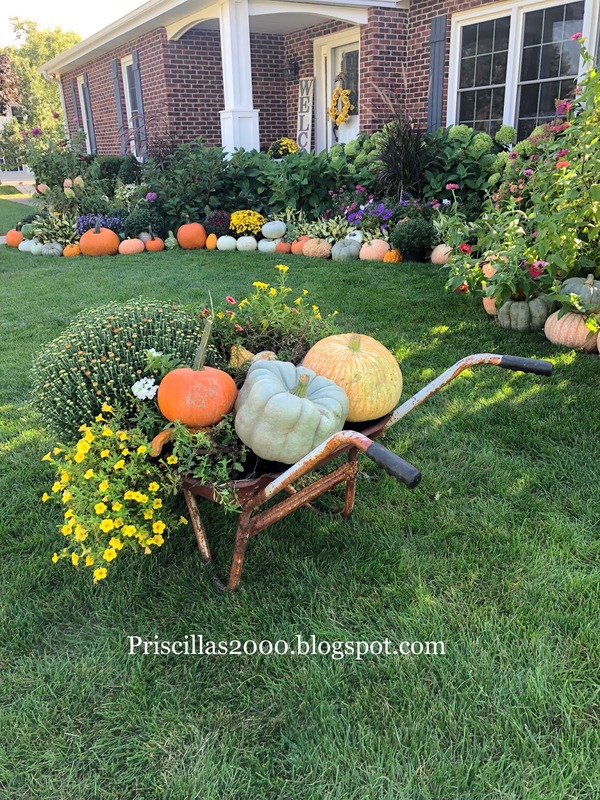 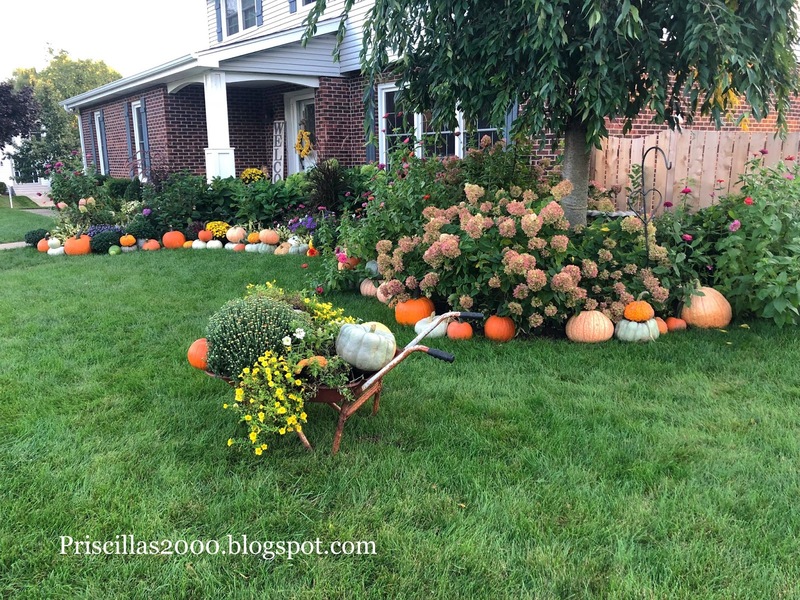 Fall home tour video .. The spooky string is all finished up and ready for Halloween display ! 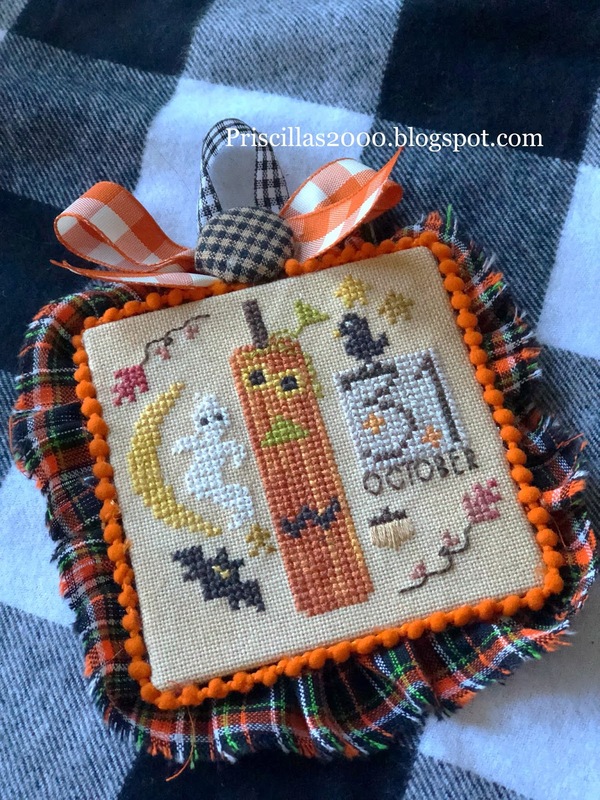 Love the little ghost ..candy corn pick! I mounted the stitching on sticky board and also black homespun on a piece of sticky board .. 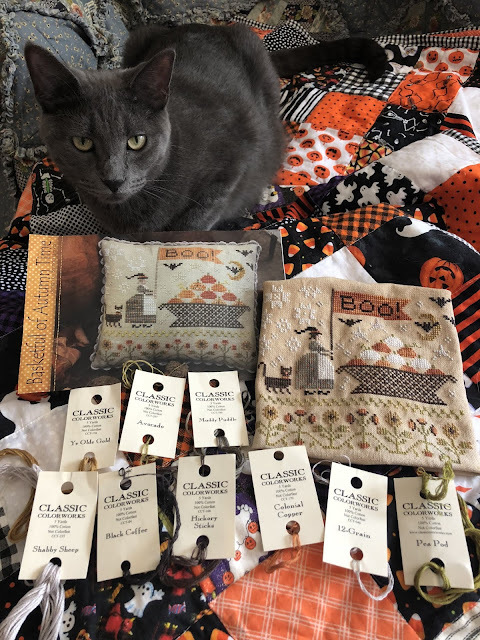 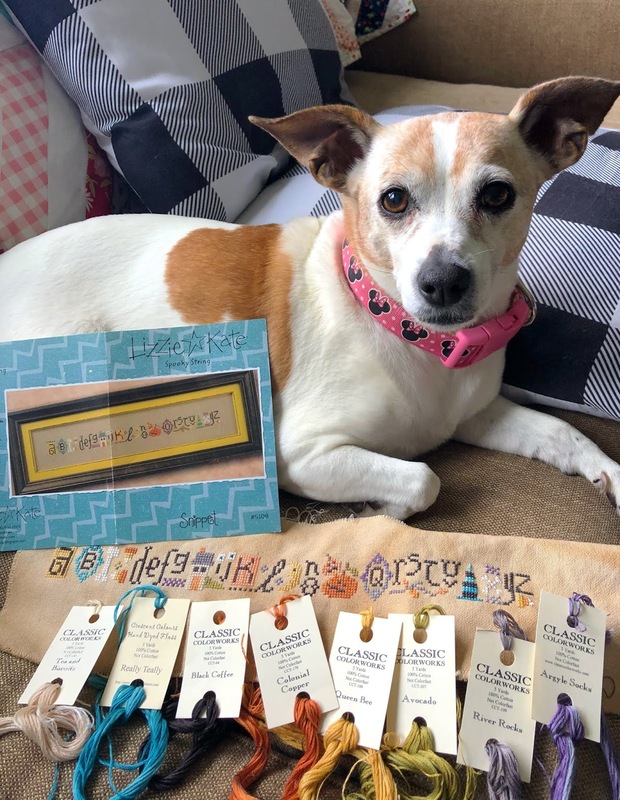 I made a bow from orange gingham ribbon ..black ticking ,,and lady dot creates licorice ric rac .. I covered a button with Halloween plaid fabric and added the Halloween pick ..It is cute ! 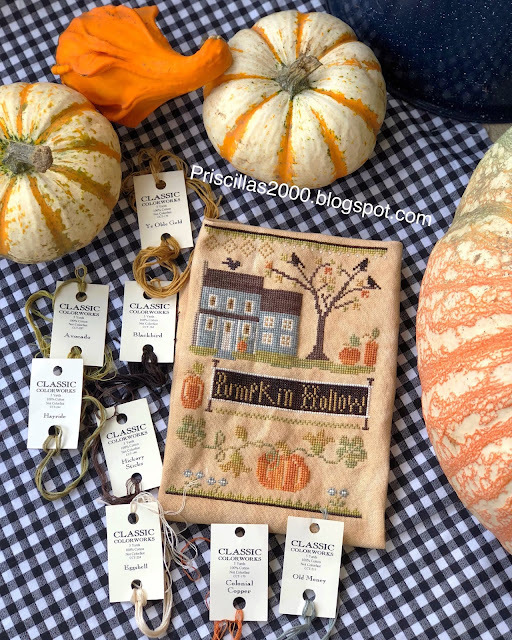 Classic Colorworks floss I used is below..I forgot to add the Pumpkin Harvest color in the photo ..
all colored text is clickable for more details..
( Chelsea's chickens :) Ronnie's mad because it is raining ..she wants to chase those chipmunks! 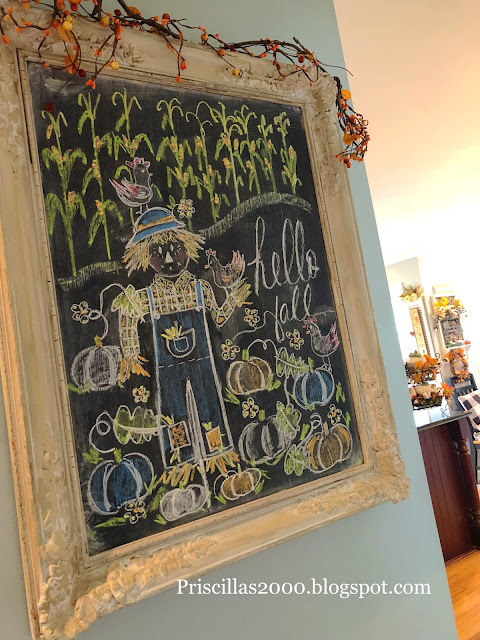 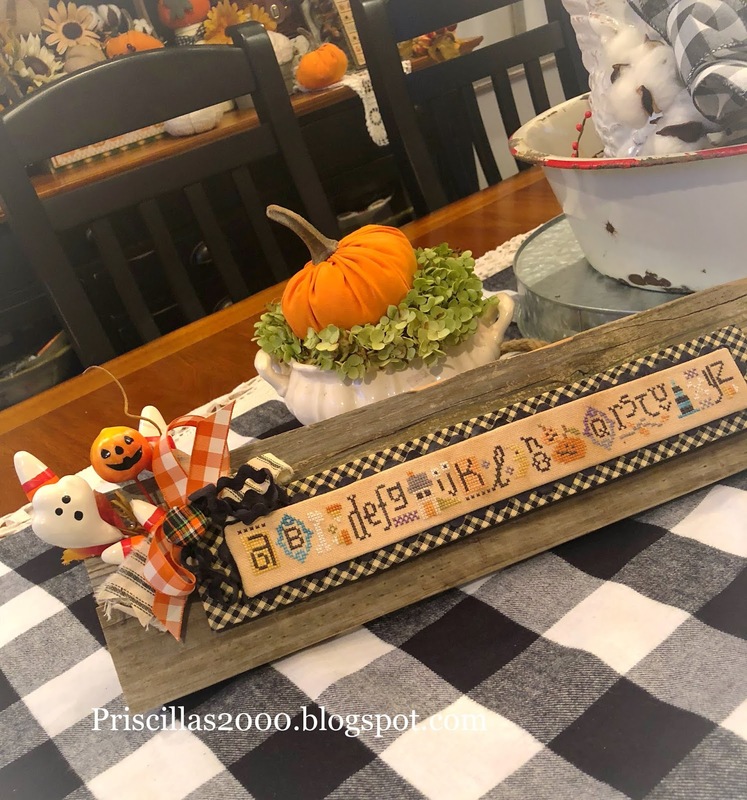 This frame was found out rummaging and I had a piece of wood cut to fit that I chalkboard painted ..one of my favorite things to decorate for the seasons! 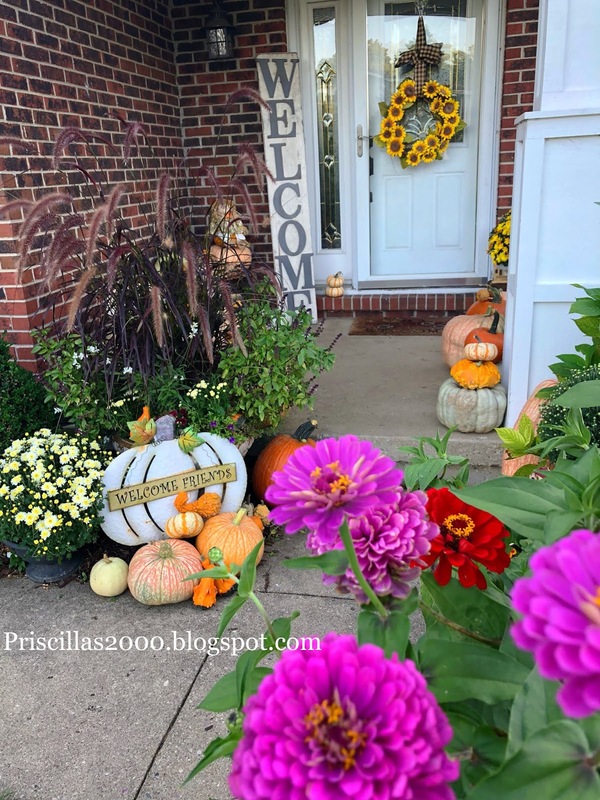 It's one of those cloudy dreary days here .. seems like Fall but still pretty hot! 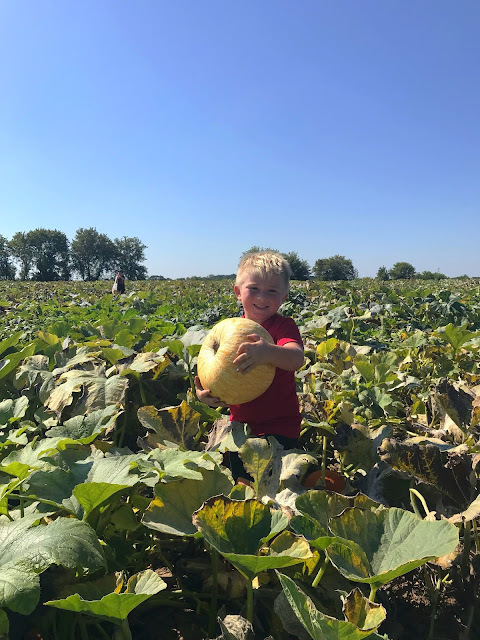 We picked pumpkins this weekend and it was HoT! 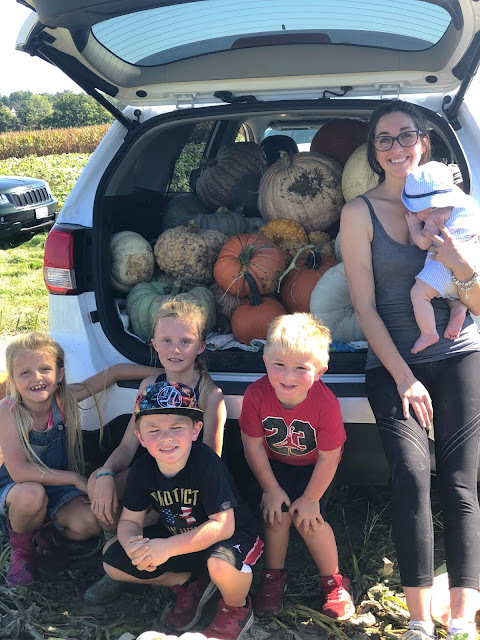 We were all set to go apple picking but then saw on Facebook the pumpkin patch was opeing on Saturday instead of this Wednesday! so change of plans! It's a family tradition and every year we fill up our cars! Love these greenish almost teal blue ones! 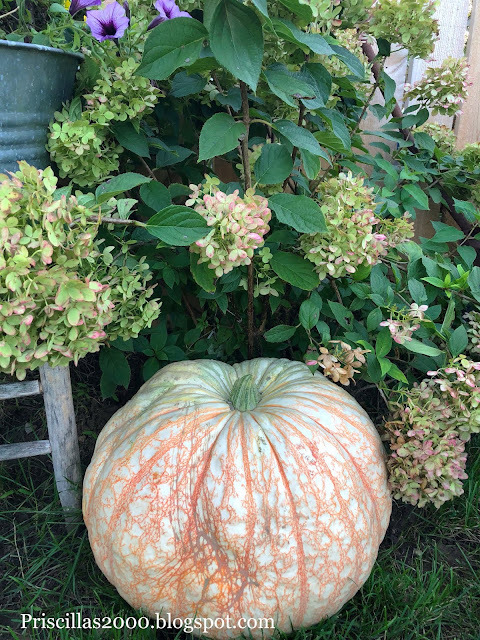 Look at the huge orange stripe! 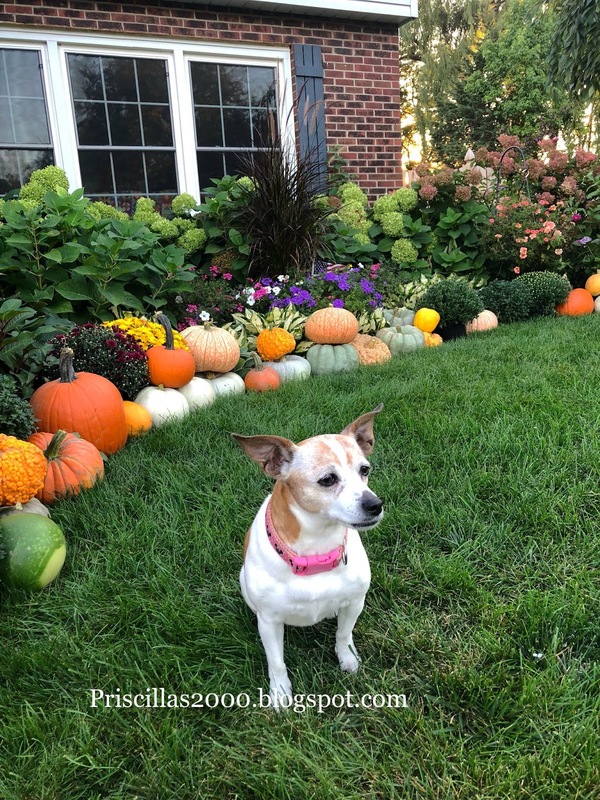 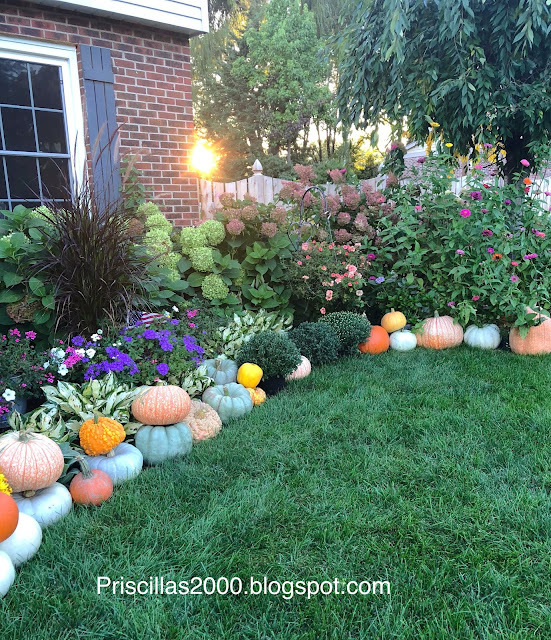 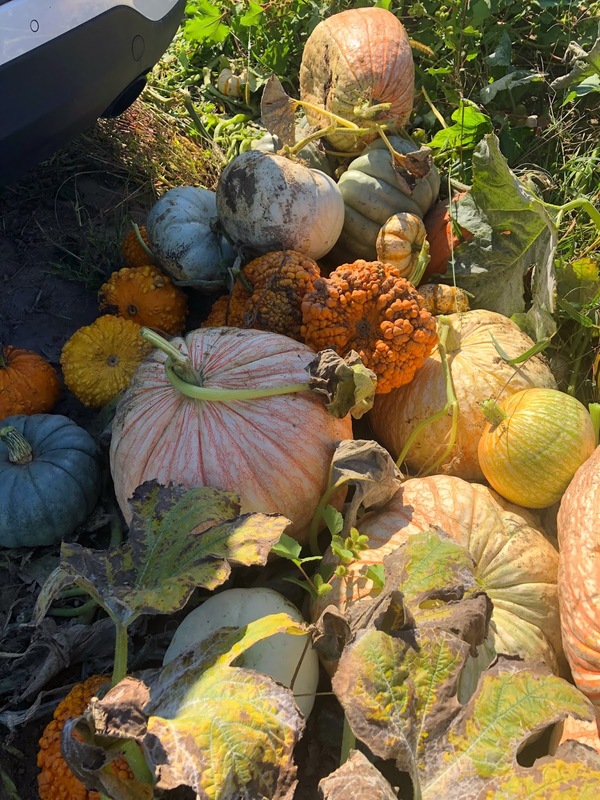 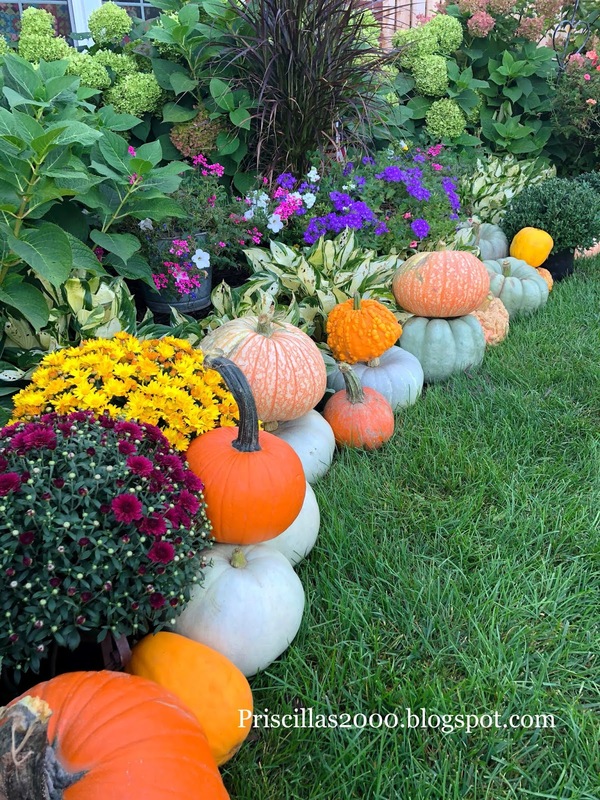 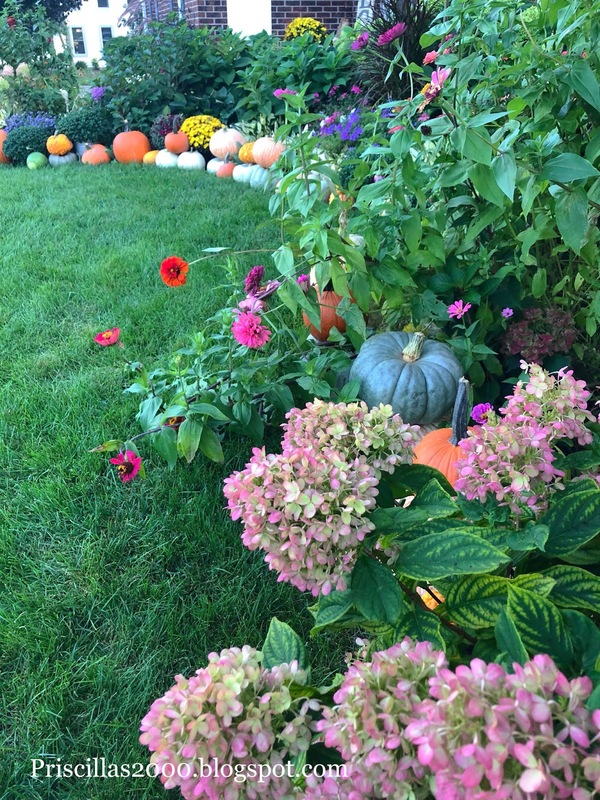 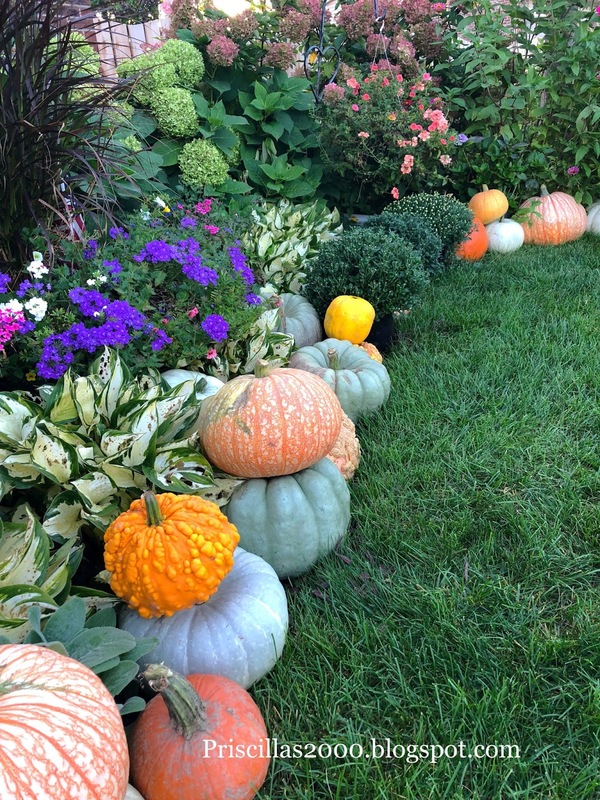 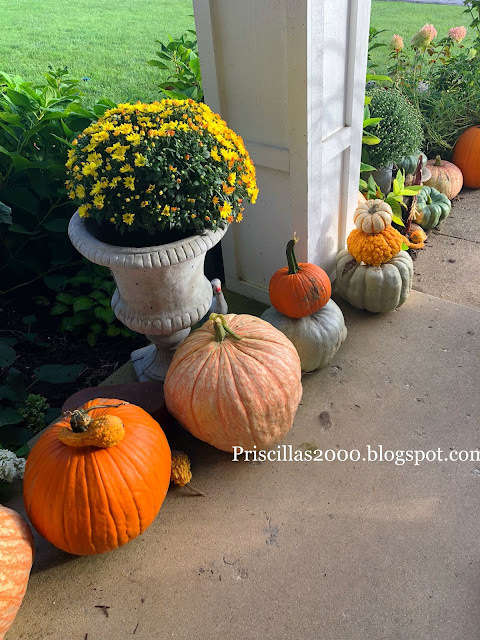 I don't wash the pumpkins when we get home .. as I water my flowers or it rains it washes the dirt off..
Love the stripey ornage ones that look like they have lace overlays..
all these are waiting to get placed in the car ..
Love all the colored and lumpy pumpkins! 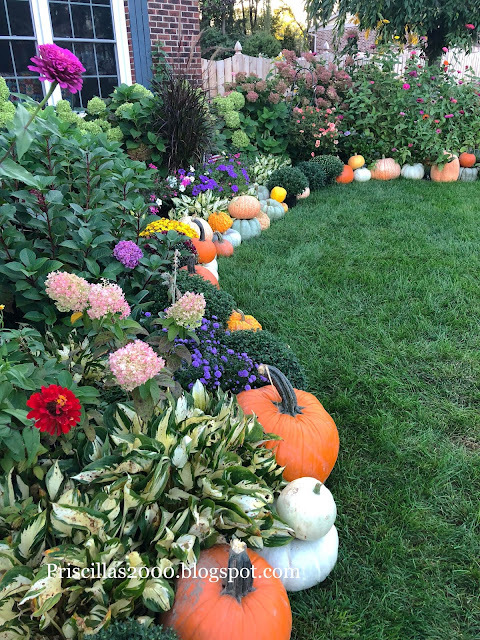 There are 100 pumpkins decorating the front yard .. a lot will be carved for Halloween and last year when Halloween was over I placed a Craigslist ad for free pumpkins and a nice family with goats came and picked them all up ..she said she would love them again this year!